Donora, Pennsylvania, would likely not exist today if town founder William H. Donner hadn't finally persuaded Margaret Heslep, a surprisingly crafty negotiator, to sell her land. 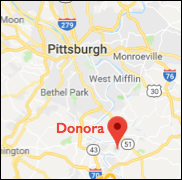 If you've ever wanted to start your own town, there may be no better formula for it than the one William H. Donner used to start Donora at the turn of the 20th Century. Donner was a colleague of banking and industrial magnate Andrew Mellon, and they had decided to build a series of steel mills south of Pittsburgh. Donner found in some land along the Monongahela River the perfect spot to create a town. Let's take a look at how he did it.